On the occasion of Christmas and New year, Valentine's Day, Father's Day, ... or any other event important to you and your family, Pier Juan offers beautiful gift boxes accompanied by pairs of socks for man. 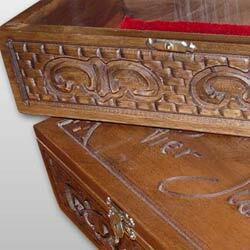 for your gift ideas , Pier Juan created for you this beautiful wooden box Walnut, carved entirely by hand. Inside this package is lined in red velvet. Made of handcrafted limited edition, it represents a gift idea . We offer a selection of boxes accompanied by 3 or 6 pairs of socks Pier Juan that will allow you to enjoy our best products at attractive prices. Choose your package to suit your tastes and your budget. 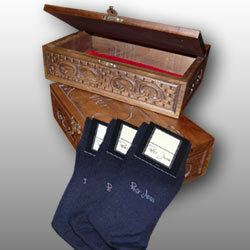 You can also compose your own gift box with your choice of socks. The package is only available in our accessories line. Beautiful gift box walnut carved entirely by hand and accompanied by high quality socks in cotton wool and blended in our range "Prestige". Discover a thin sock and warm both where your foot will be warm without sweating and this throughout the year, all in a package of emergency. Gift box for men "Elegance"
Beautiful gift box walnut carved entirely by hand and accompanied by our fine cotton socks in the range "Elegance". Discover a fine, breathable sock that will delight your feet. Beautiful gift box walnut carved entirely by hand and accompanied by high-end socks specially designed for people with sensitive legs or for people with diabetes. Discover a thin sock and warm both where your foot will be warm without sweating and this throughout the year, all in a package of exception. Beautiful gift box walnut carved entirely by hand and accompanied by high quality socks in our range of Silk and cotton mixed. Experience the incredible thinness of these socks.